[WAI•O•BLUE] Acceleration•CompetenceBlog-enWhen we have a distributed Scrum? When we have a distributed Scrum? I'd like to present you my personal definition of "Distributed Scrum". Do not take it too serious. But on the other hand it's not so wrong too. In discussions with newbie's about distributed scrum I often notice, that they put it in relation with nearshore/offshore teams. This gave me reason for finding a simple definition, that makes sense for business people too :-). TO BE ONE TEAM IT "HAS" TO USE SAME COFFEE MACHINE. If they don't do, they are distributed and should organize themselves as distributed scrum teams do. 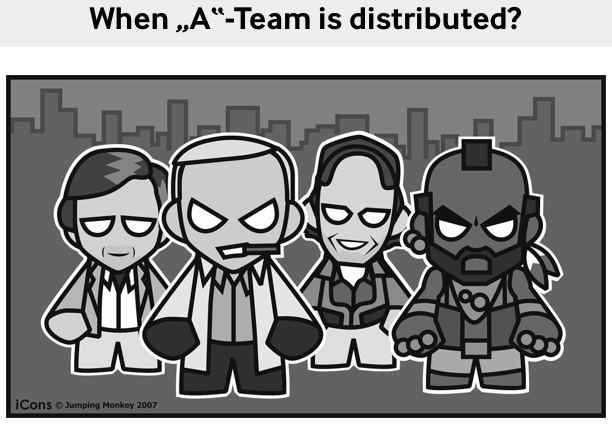 I often saw on customer side, that those teams are not aware of being a distributed teams. In other words companies with multiple offices, even in same street/city/country have distributed teams and should be aware of that while implementing scrum.